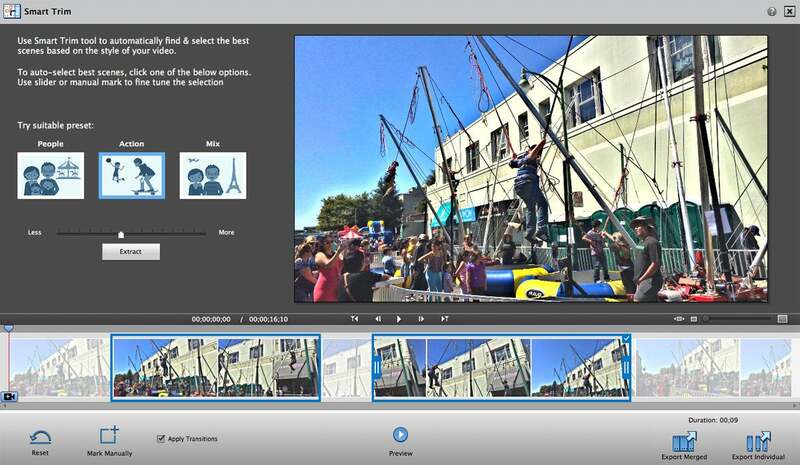 As Adobe boosts the presence of its AI (artificial intelligence) and machine learning framework within its consumer imaging apps, Premiere Elements 2018 ($100 on Amazon) benefits with new features like Candid Moments and Smart Trim, as well as some intelligent updates to the companion Organizer app that ships with both Photoshop Elements and Premiere Elements. Going forward, Elements adopts an updated naming convention that uses the upcoming year as part of the software name, as opposed to old-fashioned version numbers. The previous version number was 15. AI-powered Auto Curate gives slideshows some oomph. 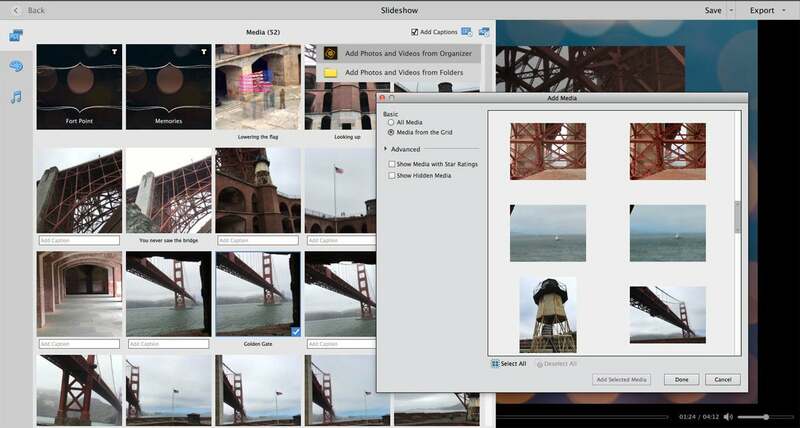 Adobe’s Organizer helper app, which ships alongside both Photoshop Elements and Premiere Elements, offers an updated, wall-to-wall view of your photographic assets in much the same style as photo apps from Apple, Google, and Flickr. (For a detailed discussion of specific Organizer updates, see our review of Photoshop Elements 2018. Premiere Elements puts the Organizer’s Auto Curate—a headlining feature for the new Elements package—to good use with its new features, Candid Moments and Smart Trim. The feature also supports an overhaul of the Slideshow tool, which turns out a template-driven animated visual within minutes for sharing on social media. Sometimes you just want to showcase a single frame from a video, but to do that you must painstakingly scrub through a movie to locate and select those frames. 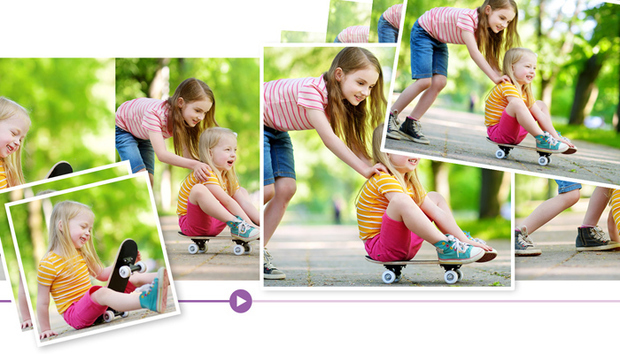 Or you can let Premiere Elements’ new Candid Moments tool do it for you. This AI-infused feature is designed to do automatically what you would otherwise do visually: scrub through your footage for the best single shots. After you review and approve the app’s still choices—you can add to or subtract from the auto selections—Premiere Elements places the images into a separate folder. 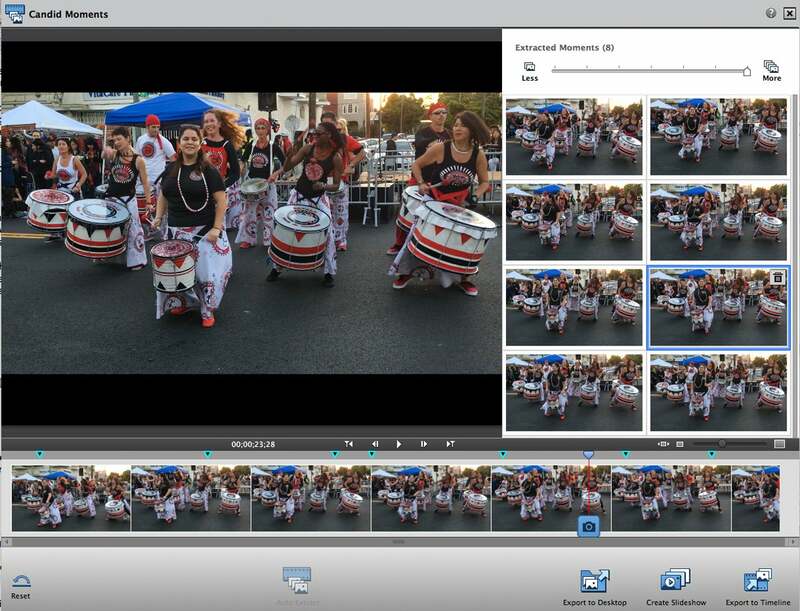 Premiere Elements marks the spot where it derives the stills from your video. Candid Moments: In almost every video, I found stills that I liked better than the ones the program automatically chose. In analyzing why the AI engine chose the frames it did (interesting lights, objects in focus, and of course faces and groups of people), its selections made sense. Nevertheless, I found the initial results hit or miss, especially with only six frames chosen by default; you can use the slider to generate additional frames. While auto choices were sometimes less than satisfying, the app did much better with people than with animals. Bottom line: I look forward to continuing improvements in this useful feature. Almost all videos have excess boring footage that adds nothing to the production or message except excessive length, but it’s a tough manual process to expurgate all dull instances throughout a clip. 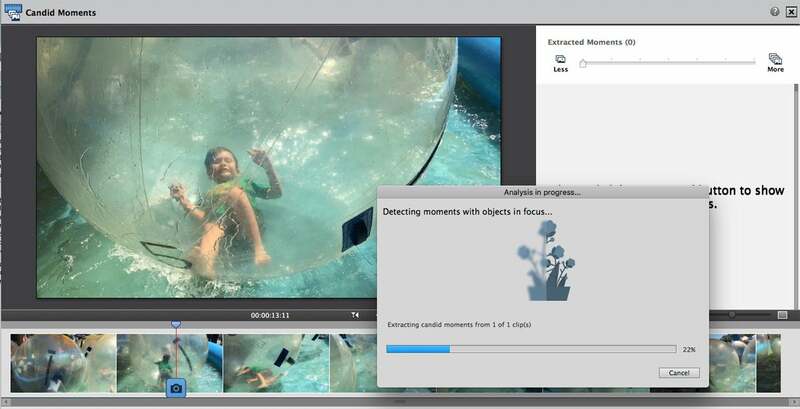 That’s where Premiere Elements’ new Smart Trim feature comes in, using intelligent analysis to scan content and determine what can be removed without compromising the overall contextual message. Smart Trim worked well, especially on footage that doesn’t feature narrative or music. You can assist by customizing the algorithm to look for people, action, or both, and extract the minimum or maximum amount from the final version. 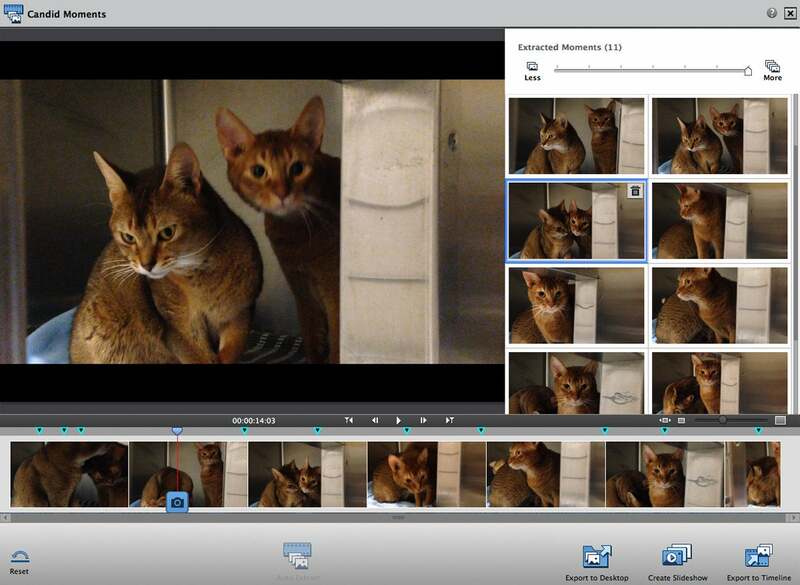 The feature maintains flexibility by letting you easily add footage back into the movie right on the timeline without a lot of tedious snipping and trimming. The program automatically assembles all the clips with transitions into a final product, for quick, no-fuss posting on social media. The tool worked well with casual videos, especially those without a defined soundtrack, as opposed to voice narratives, demos, or musical performances where, despite the transitions, cuts sounded a lot less subtle. 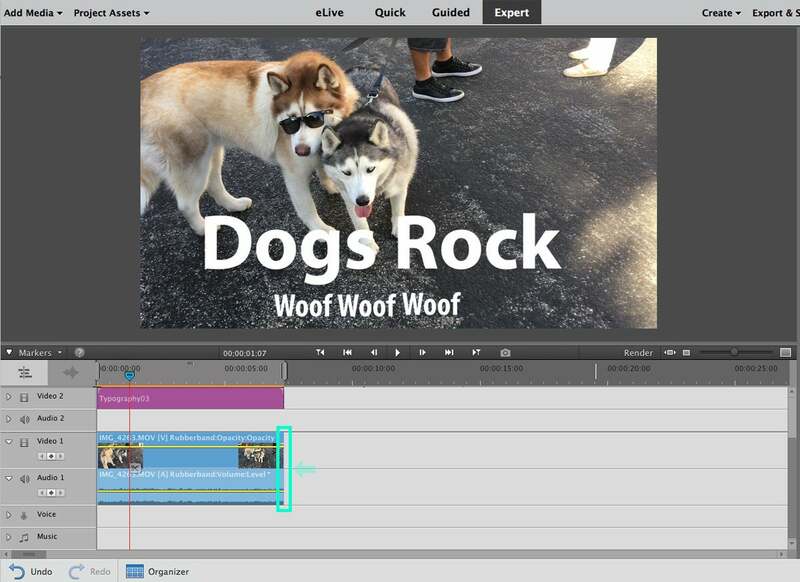 A mainstay of Elements core functionality, Guided Edits are the app’s extremely popular step-by-step recipes for how to create specific special effects and actions with both photos and videos. Every upgrade hosts several, and I tried them on for size. Animated Social Posts: This neat storytelling tool lets you apply customizable static or animated text effects to a short video to quickly create social media memes and messages. Quite a variety of templates are available in categories like Decorative, Geometric, Formal, and Fun. 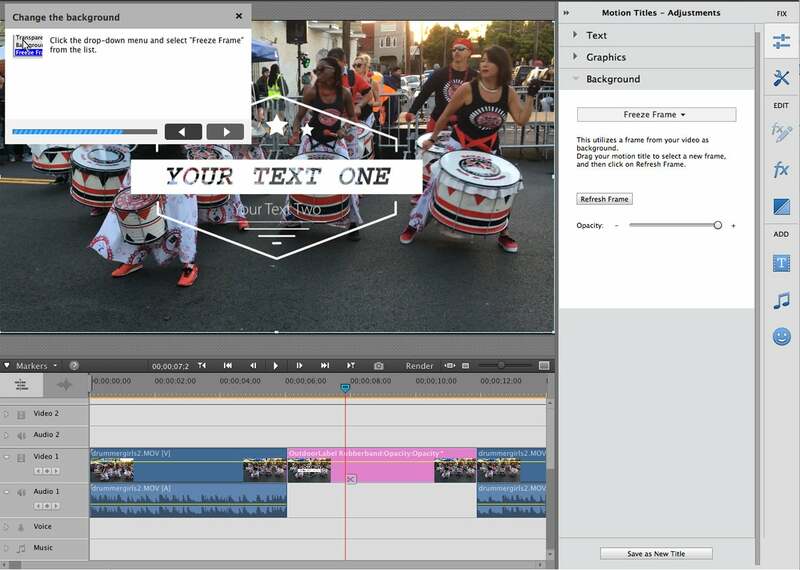 You just need to choose one, set the start and end points for the animation, and type in a stylized message. There’s no complexity to the process and the results can be stunning. Freeze frames with motion titles: This guided edit lets you emphasize parts of your video by freezing a frame and then adding a motion title. You just have to specify which frame you want to use while the guide takes you through some easy steps. This handy video style lends a touch of sophistication to your videos. Bounce-back effect: Many of us are familiar with animated effects that make the subjects loop their actions forward and backward—like with Instagram’s Boomerang and Apple’s Live Photos. 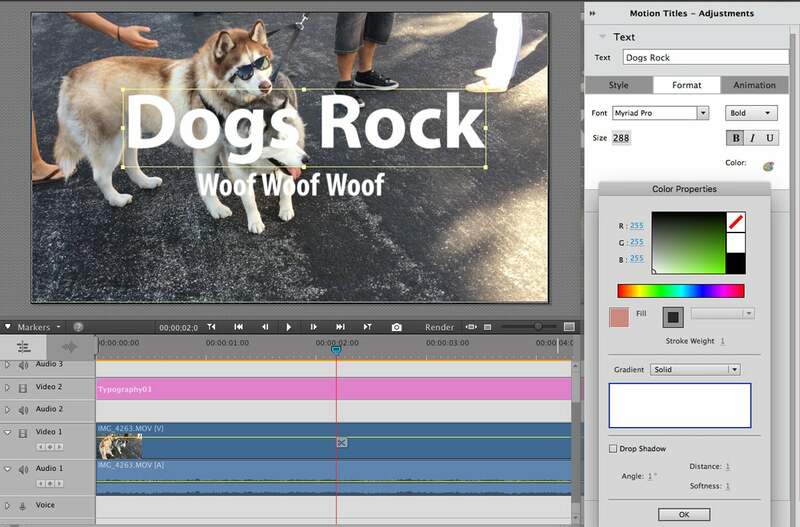 Now, Adobe has come up with a technique that does something similar with a few customizable steps to create a sharable short video. Bounce-Back: Time stretch, reverse, rinse, repeat. Watch Lila climbing in and out of her basket. Fix Action Cam Footage: This guide is designed to fix fisheye lens distortions from GoPro and similar cameras as well as trim and correct color. 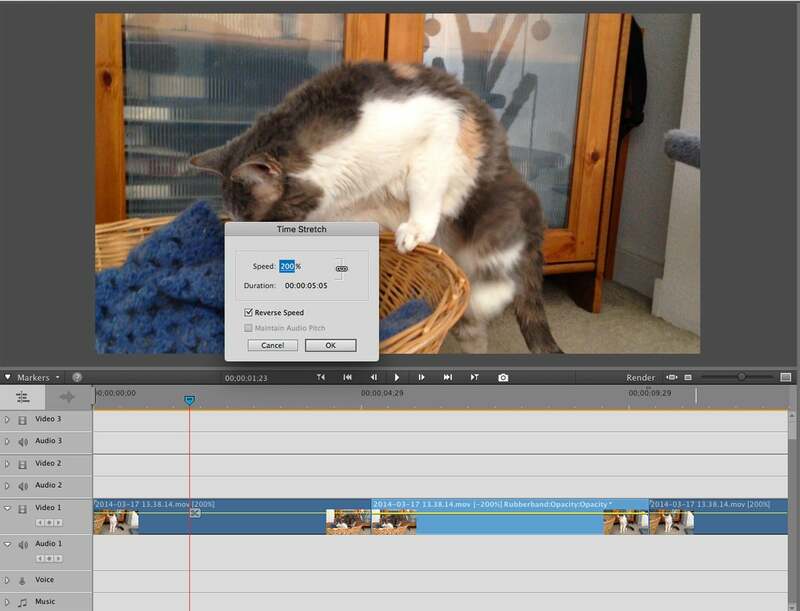 The edit sequence first trims the fat off of your video to distill it down to the best footage. From there, you apply the Lens Distortion effect, adjusting the Curvature slider until the video looks in perspective. The last step is color correcting the entire clip, and you’re in business. Or you can just trim and color correct the video yourself and use the Lens Distortion effect on its own, as you could in the previous version. The Fix Action Cam footage guided edit can nix lens distortion, but it is often a painstaking process. See before and after perspectives. While the edit worked to improve GoPro footage, it was a slow, processor-intensive experience, often accompanied by fan action from my late 2013 MacBook Air. Performance was inconsistent: The slider acted intermittently cranky, balking with a beachball at being moved, though at other times it moved without incident, while the preview moved haltingly, playing catch up with both slider adjustments and the timeline marker. 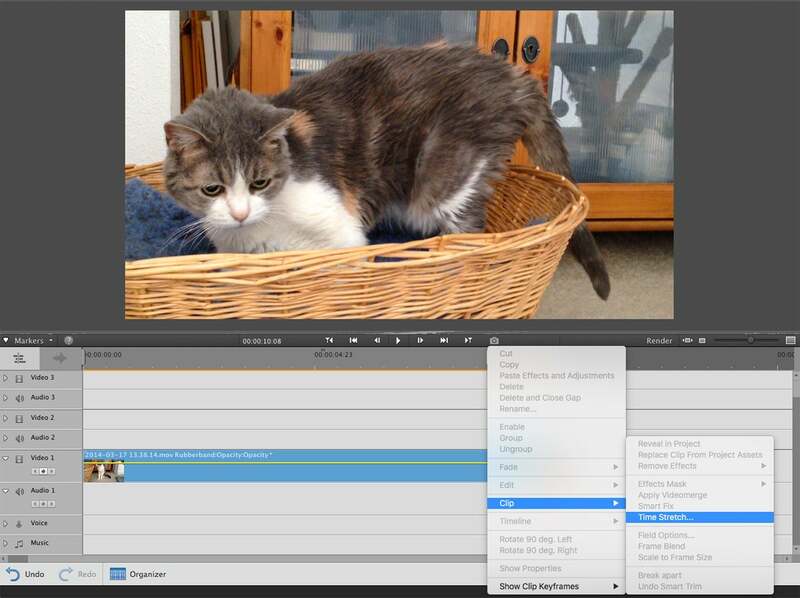 While it’s not in the guided edit, Adobe recommends rendering the timeline just after Importing a video clip and also after completing the Action Cam Guided Edit for smoother previews. The Lens Distortion controls respect your last setting, and do not revert to zero with new clips. HEVC (High Efficiency Video Coding, also known as H.265) is a relatively new, highly compressed video format, has arrived with iOS 11 and macOS High Sierra, and is already supported by Apple’s iMovie. 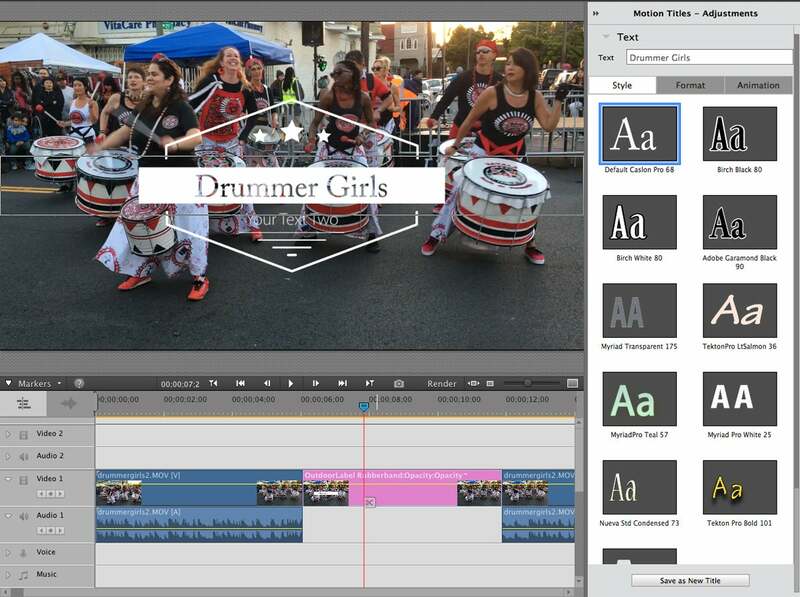 Adobe has yet to adopt it for Premiere Elements. Thus owners of iPhone 7 and later will have to use the Camera app’s Most Compatible setting so that their files can be viewed and edited on the desktop in Premiere Elements. Despite the popularity of Virtual Reality and headset viewing, and broad social media adoption of this kind of output over the last couple of years, Adobe does not consider the VR crowd as part of its target market. That means if you bought one of these newly affordable 360-degree cameras, you will not be able to edit that footage with this app. Premiere Elements customers may not be the edgiest hipsters on the block, but enthusiasts are showing intense interest in 360-degree cameras, as they are dead simple to use, and prices are dropping. Hopefully, we’ll see some features catering to that audience in future versions. I’ve always admired Premiere Elements for its consumerist ease of use and dedication to making extremely complex operations accessible with its guided edits. This version still does that, with a boost of intelligent automation from the updated organizer and social networking oriented guided edits. Various performance issues marred the Action Cam Guided Edit, which could have been more streamlined and fluid. It would be nice to see Elements recognize new and increasingly popular technologies like 360-degree video, which is being targeted to consumers and hobbyists who align with Elements’ own memory maker crowd.